On the last day of June, the 81st Avenue Library hosted the graduation of the fifth Oakland Voices class. Nine Oakland residents, spanning in age from 18 to 70, completed a community journalism project that is as colorful and diverse as Oakland itself. This crop of graduates have contributed a wide variety of projects. Three correspondents produced stories that were aired on KALW public radio. The class created an actual printed paper, called the Oakland Voice, that is being distributed at selected libraries and community centers in East Oakland. 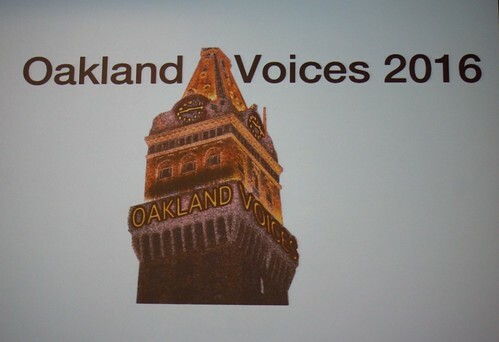 In all, the class produced 85 stories, photo essays and videos for the Oakland Voices website oaklandvoices.us. 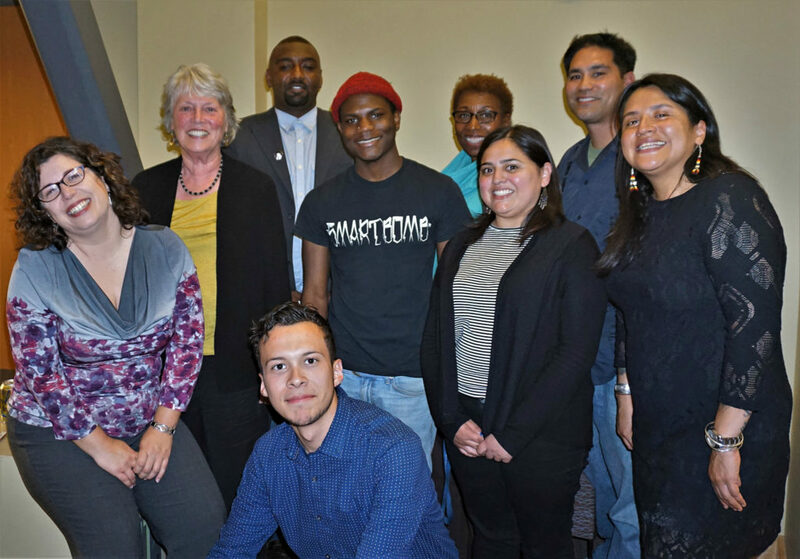 Oakland Voices is a nine-month program that trains East Oakland residents to tell stories about their neighborhoods, focusing on the strengths of the residents and organizations, as well as the challenges they face. Cinque Mubarak, a longtime Oaklander who has lived in almost every part of the city, was a member of the class. Damu Dailey said he worked to capture the subtext and underlying narratives of Oakland. He created a hard-hitting KALW story on the history of East Oakland’s Evergreen Cemetery and the Jonestown Massacre. This was the second year of a collaboration with KALW public radio. Oakland Voices correspondents pitched story ideas to the station’s editors. If their idea was accepted, they worked with radio professionals to produce pieces that are aired on KALW as part of the Sights and Sounds series, posted on the radio website and on the Oakland Voices website. Last year, the joint project received the prestigious Northern California Society of Professional Journalists’ award for community journalism in radio. Martin Reynolds, co-founder of the Voices journalism project and former editor of the Oakland Tribune, announced at the graduation that the Voices program, KALW, the Oakland Public Library and the East Oakland Youth Development Center collectively received a two-year, $135,000 grant from the California Arts Council to produce more stories about East Oakland. Ferreira produced a KALW radio story about the impact of the Ghost Ship fire on her neighborhood. “It was important to tell a story about the neighborhood months after the mainstream media had packed up and left,” she said. Monica Scott Green, whose day job is with the Bay Area Parent Leadership Action Network, said she learned from professional journalists how to put a story together that informs and moves people. Sandra Tavel, who immigrated as a child from La Paz, Bolivia, said she is grateful Oakland Voices exists. “It makes me want to continue to preserve the stories about people who actually live and work in Oakland,” she said. Oakland Voices will be recruiting in August for the next class that will begin in mid-September. In addition to the training and experience, correspondents receive a $1,000 stipend. If you are interested in applying, please contact Oakland Voices at oaklandvoices5@gmail.com. Oakland Voices, started in 2010 as a program of the Oakland Tribune, partners with the Maynard Institute for Journalism Education, the East Bay Times, and is largely funded by a grant from The California Endowment. Brenda Payton, a former columnist for the Oakland Tribune, is the coordinator. In recent years, the Voices program has also taken place in Sacramento and Jackson, Miss. Visit www.oaklandvoices.us or follow us on Twitter.com/OaklandVoices.